The French brand's summer makeup collection is all about glow, bringing light-filled radiance and sunkissed warmth to skin -- bang on trend for SS18. Skin is the star of the show in this collection, joined by vibrant colors and high-shine lips. 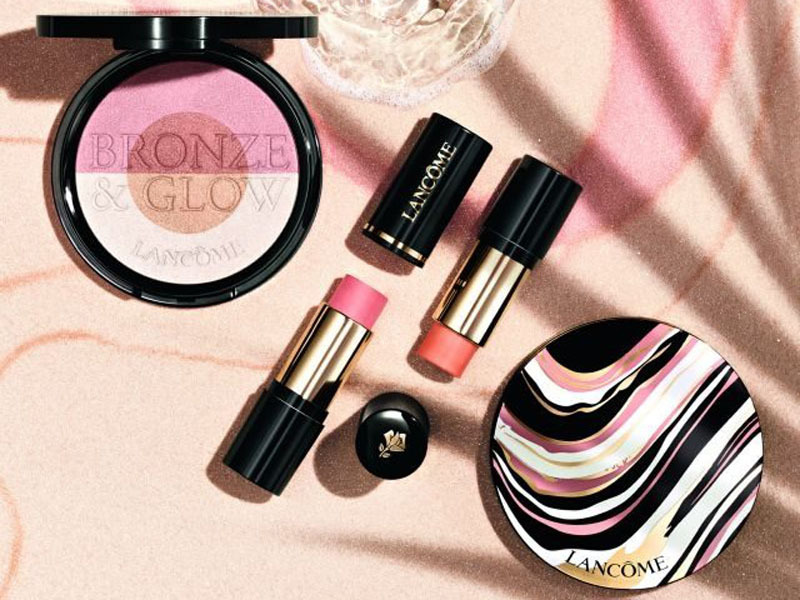 Lancôme brings a radiant glow to summer skin, playing with light and color to bring out everyone's best this season. The centerpiece of the summer 2018 collection is the new Bronze & Glow two-in-one palette, which combines the benefits of a bronzing powder and a highlighter to sculpt and illuminate the face in a natural way. This new makeup essential comes in two shade combinations to suit different skin tones. Lancôme brings bold color to cheeks in a highly practical format with its Teint Idole Ultra Wear Stick blushes. This stick-format blush is easy to apply, bringing color to cheeks in a single sweep. It comes in a selection of bold shades, including fuchsia, red and orange. The collection is rounded off with various shades of the iconic Ombre Hypnôse Stylo eyeshadow stick, as well as L'Absolu Rouge lipstick for bold, intense color, and L'Absolu Gloss for a high-shine lip. Finally, Monsieur Big Waterproof mascara ensures long-lasting definition for lashes. Lancôme's summer makeup collection is due out from April 30 via Lancôme retailers or online on the brand's e-commerce site.